Discussion of the American role in World War I can fall into two, sharply divergent camps: those (mostly Americans) who think the U.S. was chiefly responsible for the Allies winning the war, and those (mostly Europeans) who think the American contribution to victory was negligible. As for the opposing school of thought, that the Yanks contributed but little to the Allied effort, I offer this historical evidence: On September 26, 1918, the Meuse-Argonne Offensive, a combined Franco-American effort that involved more than a million Doughboys, kicked off near Verdun, site of the war’s worst bloodletting two years earlier. 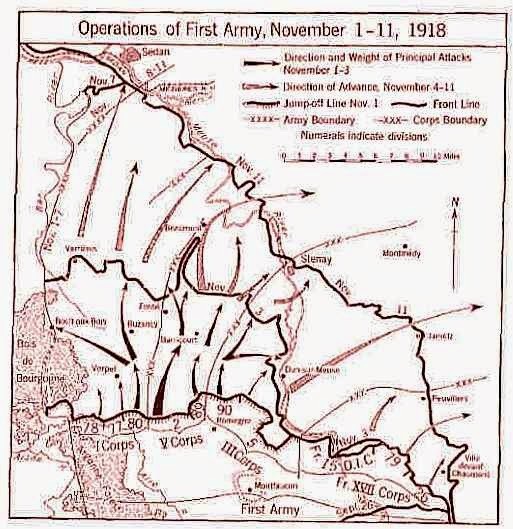 In coordination with British and French gains further to the north and west, the Meuse-Argonne Offensive (which plays a pivotal role in my Great War novel Flower of Iowa) cemented Allied victory in the war, ending only with the Armistice of November 11. But not unlike their Allies, the eager yet inexperienced Doughboys paid a deadly price. More than 26,000 American soldiers died in the Meuse-Argonne Offensive, and nearly half of them are buried in the American Cemetery and Memorial near Romagne-sous-Montfaucon. This burial place contains the largest number of American military dead in Europe from any war — more than 14,000. A beautiful and sadly under-visited place today, the Meuse-Argonne Cemetery serves as a reminder that the sacrifices of Americans in the First World War are indeed worth recounting, and remembering.